I established in a previous post that the Greenhouse Effect is a good thing for life on the planet. So what is the problem? Well the simple idea is that human activities and the massive growth in human populations seen over the past two hundred years have changed the composition of the atmosphere. The concentration of greenhouse gases has risen and this enhanced greenhouse effect is causing climate change. The first image shows the main gases in the atmosphere that contribute to the Greenhouse Effect. Anthropogenic means “caused by mankind” and so you can see what humans are doing to generate an enhanced greenhouse effect. The GWP figure stands for Global Warming Potential and gives a relative value for how each gas might contribute to climate change. One molecule of CFC-12 is as powerful as a greenhouse agent as 10,900 molecules of carbon dioxide. This second table shown above demonstrates how the composition of the atmosphere has changed from pre-indutrial to modern times. I am going to focus on the two greenhouse gases at the top of the list: carbon dioxide and methane. Scientists at the Maunua Loa Observatory in Hawaii have been measuring atmospheric carbon dioxide concentrations since the 1950s. Here is a graph of their results. What do you notice about this graph? There is a gradual upward trend such that the average concentration has risen steadily over the 50 year period. If you want data going back further into the past, you need to look at ice core data. Tiny volumes of the atmospheric gases are trapped within ice as it forms in Antartica and by drilling out a core and analysing the gases it contains, one can determine the concentration of the atmosphere when the ice was formed. The deeper parts of the core formed longer ago so a journey through an ice core is like travelling back in time…..
What human activities might be responsible for these changes in carbon dioxide? Methane is also a potent greenhouse gas. It is produced as waste product of the bacterial reactions that happen inside the rumen and intestines of cattle. (The rumen is the large first chamber of their stomach in which bacteria digest cellulose in the cow’s food) I was once told that each cow produces 65 litres of methane a day but I have never measured it myself……. Seeing as the world population of cattle is estimated at 1.4 billion, that is a lot of methane each day being released into the atmosphere. Methane is also produced by bacteria that break down our domestic waste in land fill sites and by anaerobic bacteria that live in paddy fields in which rice is grown. More humans means more cattle, more rice and more landfill and all of these are responsible for the rise in methane concentrations seen in the atmosphere in recent times. The Greenhouse Effect is the name given to the way in which the earth’s atmosphere acts to warm up the planet. The earth and the moon gain almost exactly the same incident radiation from the sun and yet average temperature on the earth is stable at around 14 degrees Celsius. On the moon the temperature fluctuates wildly from 1oo degrees Celsius during the day to minus 153 degrees Celsius at night. Life would be impossible in such extreme and variable conditions and so the greenhouse effect is definitely a “good thing” for life on our planet. How does the greenhouse effect work? Well the main idea here is that there are certain gases in the atmosphere that can trap the infrared radiation that the earth emits and prevent it escaping the atmosphere. These greenhouse gases are warmed as they absorb the infrared and so the atmosphere heats up. Remember that because the sun is so hot, it emits radiation at a much higher frequency. This is mostly in the “visible light” part of the spectrum together with some ultraviolet. The gases in the atmosphere cannot trap visible light (air is transparent as you have probably noticed) and so most of the solar radiation passes through the atmosphere and hits the earth. Which gases can act as greenhouse gases? Well of course the problem is that human activities over the past century or so have altered the composition of the atmosphere so that the concentration of greenhouse gases has risen. This has meant more heat is trapped and climate systems are altered in consequence. This enhanced-greenhouse effect is the problem and I will look at this in the next post….. Climate change remains one of the more controversial topics in the IGCSE Biology specification. Just in the past few weeks, the USA (one of the finest nations on the planet) has elected as their President someone who has stated on record that he believes in some giant conspiracy theory about climate science centred around the Chinese…. The overwhelming majority of climate scientists do not support this interpretation of the facts. They are able to provide evidence of rapid climate change over the past few decades and link this to human-induced changes in the composition of the atmosphere due to pollution. When these facts are linked by a sensible scientific theory that proposes how and why certain gases might lead to an increased warming effect in the atmosphere (the so-called greenhouse effect) the evidence in support of human-induced climate change becomes compelling. Keeping US manufacturing competitive is important of course, but not at the expense of the enormous environmental and financial costs of allowing our pollution of the atmosphere to continue unchecked. I am not sure I will be able to convince President-Elect Trump (he probably doesn’t read my blog in any case) but perhaps I can show you the kind of understanding needed to generate A* answers in GCSE questions on this topic…? I am going to organise this work into several sections and will post on each topic in the coming week…. What is the evidence for climate change? How are human activities altering the make up of the atmosphere? What are the predicted consequences of climate change in the coming years? Deforestation means the cutting down of mature forest and woodland for non-forestry purposes. No new trees are planted and so the total area of forest decreases. Humans have cut down forests for many reasons and have built their economies on exploiting natural resources. Forests today are cleared to provide wood for logging, to provide land for building homes, for subsistence farmers as well as for commercial growing of crops and cattle farming. What are the biological consequences of deforestation? Growing trees have a net uptake of carbon dioxide and a net loss of oxygen due to photosynthesis. Carbon dioxide is a gas that acts as a pollutant in our atmosphere because it is a greenhouse gas. Carbon dioxide concentrations have been rising over the past century and this is leading to permanent and potentially damaging alterations to the earth’s climate system – a process called climate change. Oxygen is the gas that almost all organisms require for their respiration. In many tropical regions, forests protect the sometimes violent tropical storms from hitting the ground. When forest cover is removed, rainfall hits the soil much harder and this can lead to loss of topsoil in a process called soil erosion. As the water runs through the soil, it will dissolve minerals as it goes, thus leaving the soil that is left denuded of essential minerals for plant growth. This leaching of minerals makes it difficult to use the land cleared for agriculture and so more forest is cleared. Deforestation also disrupts the water cycle. Trees move large volumes of water a year from the soil into the atmosphere in a process called transpiration. So when trees are lost, less water evaporates from the soil, more water is lost in run-off and so rainfall can be reduced. There is a final problem with deforestation although the examiners have omitted it from the specification for some inexplicable reason. Forests provide a habitat for a wide variety of animal and plant species. So when forests are lost, species become extinct. This loss of biodiversity is a final terrible consequence of deforestation. 80% of known species live in tropical rainforest so the fact that in the last 50 years, over half of this area has been cleared is a major concern. The rate of loss of rainforest is around 140,000 square kilometres a year although in some parts of the world, the rate of loss is slowing. Deforestation is a complex issue and a GCSE revision blog like this is not the place to go into the interesting political and cultural details. I would direct you to the WWF site for more information and indeed some ideas as to what we can do to help. The primary function of the lungs is to allow gas exchange to occur. Oxygen gas can diffuse into the blood from the air in the lungs. 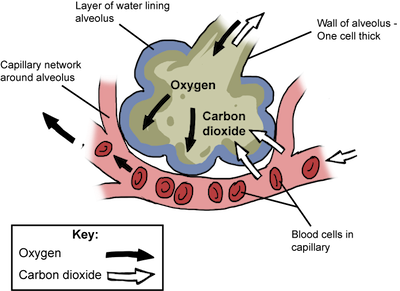 Oxygen of course is needed for the process of aerobic respiration that is happening in every cell all the time. Aerobic respiration produces carbon dioxide as a waste product. 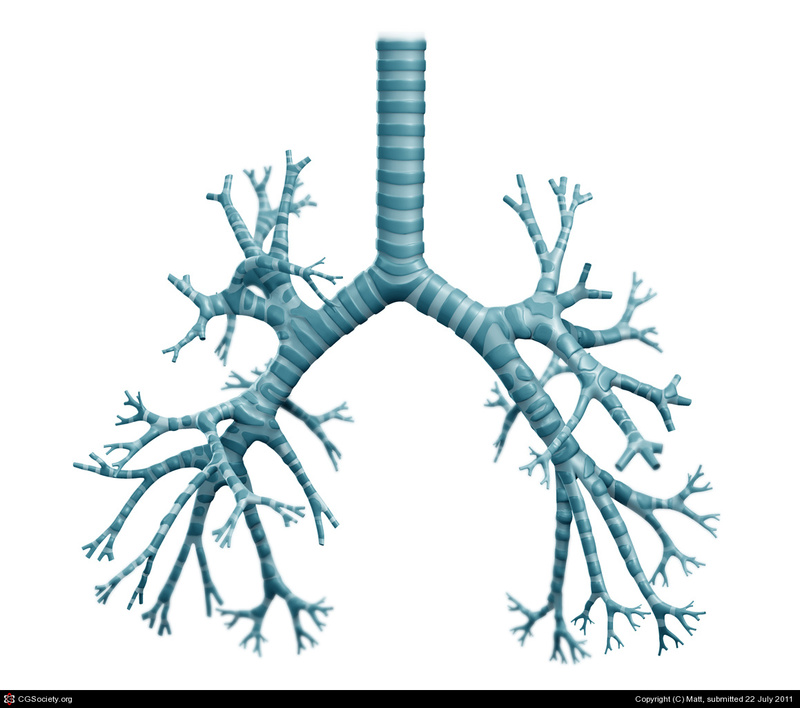 Carbon dioxide diffuses out the blood in the lungs into the air in the lungs. Hence the name gas exchange – one gas (oxygen) diffuses in, another (carbon dioxide) diffuses out. Diffusion is the passive movement of molecules of a liquid or gas from a high concentration to a low concentration. So the first question is what ensures that there is an appropriate concentration gradient for each gas to diffuse? In order to understand this, you have to remember that the blood going to the lungs is deoxygenated. 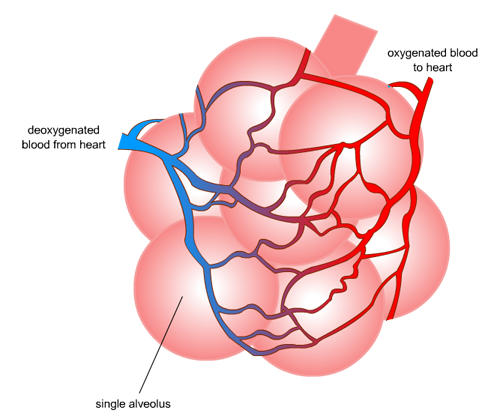 The right ventricle pumps deoxygenated blood to the lungs in the pulmonary arteries. The tiny alveoli are then covered with capillaries and these join together to form the pulmonary veins. The pulmonary veins carry the oxygenated blood back to the left atrium of the heart. So the blood coming to the lungs will have a low oxygen concentration but a high carbon dioxide concentration. How are the structure of alveoli adapted for efficient gas exchange? The alveoli in total provide a large surface area for the diffusion of oxygen and carbon dioxide. The total surface area of the alveoli in humans is approximately 90 m2 – the equivalent of two tennis courts….. The alveoli have a rich blood supply. Alveoli are lined by many capillaries. The surface of the alveolus is moist. Gas exchange surfaces are always moist as oxygen and carbon dioxide will diffuse more rapidly if they are dissolved in water. Alveoli also contain a cell that secretes surfactant. This molecule reduces the surface tension in the film of water that lines the alveolus, allowing air to move in and out more smoothly. The independent variable (light intensity) is on the x axis and the dependent variable (number of bubbles per minute) is on the y axis. How do we explain the pattern in this graph? As the light intensity increases the rate of photosynthesis increases. This is because a higher light intensity gives more energy to the chloroplasts and so more reactions can happen per second and the rate goes up. But beyond the orange dot on the graph, the increases in rate slows down until at around 12 units of light, adding more light has no effect on the rate. At these high light intensities some other factor is now the limiting factor as opposed to light intensity. The limiting factor remember is the factor in the shortest supply. So perhaps above 12 units of light photosynthesis is limited by the concentration of carbon dioxide. The only way to find the limiting factor is to repeat the experiment with more carbon dioxide and see whether the rate is higher above 12 units. Although this graph is not perfect, it does show how the rate of photosynthesis varies at different light wavelength. 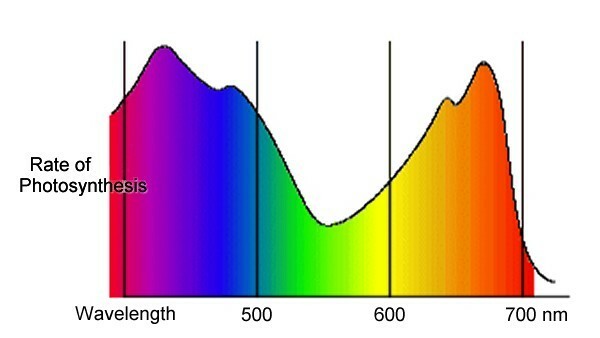 Rates of photosynthesis peak in the blue-violet and red parts of the visible spectrum with a much lower rate in green light. The reason for this is that chlorophyll pigments do not absorb green light well. The pattern is similar to the light intensity relationship. When carbon dioxide concentrations are low, it is the limiting factor for photosynthesis and so increasing the concentration will increase the rate. As the graph levels off, some other factor is now the limiting factor – perhaps light intensity or temperature. Temperature is a factor that affects photosynthesis because of enzymes. Many reactions in photosynthesis are catalysed by enzymes and enzymes all have an optimum temperature. This pattern is not explained by limiting factors. At low temperatures the rate is low because the enzymes and the substrate molecules are moving really slowly. This means there are few collisions between the substrate and the active site of the enzyme. 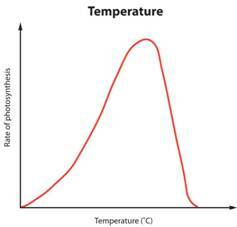 As temperature increases, the rate increases as there are more collisions and more enzyme-substrate complexes are formed per second. But high temperatures denature enzymes: the bonds that hold the enzyme in its precious 3-D shape are broken and the enzyme molecule unravels. So the active site may either change shape or may be lost as a catalyst. This slows the rate down to an extremely low rate. Photosynthesis is the process occurring in plants in which sunlight is trapped by chlorophyll pigments and used to power the chemical reactions involved in making food molecules such as carbohydrates from carbon dioxide and water. Oxygen is released as a waste product of these reactions. In the equation above, the carbohydrate produced is glucose, a six carbon sugar. The reactions of photosynthesis happen in specialised mesophyll tissue in the leaf of the plant (see previous post) Inside the palisade and spongy mesophyll cells there are thousands of tiny organelles called chloroplasts in which the reactions of photosynthesis occur. So what environmental factors could be altered to vary the rate of photosynthesis in a plant? 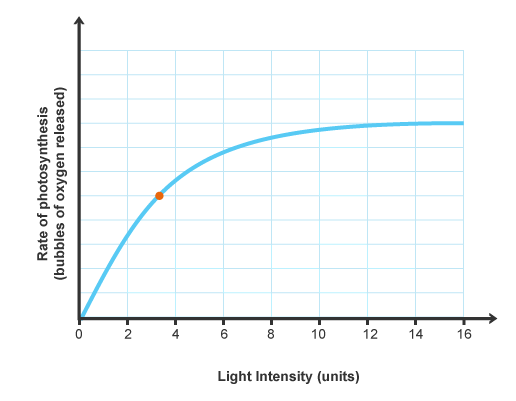 Light Intensity – light provides the energy for photosynthesis and so the higher the intensity of light, the more energy the chloroplasts receive to make carbohydrates. Light wavelength – chlorophyll pigments absorb the blue-violet and red parts of the spectrum well but cannot absorb green light. 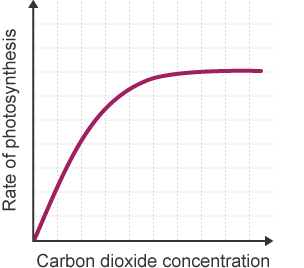 Carbon Dioxide concentration – this is a reactant for photosynthesis so increasing the concentration makes a collision between the reactant molecule and the enzyme inside the chloroplast that bind it more likely, so the rate will go up. Temperature – many reactions in photosynthesis are catalysed by enzymes and enzymes are very affected by temperature: too low temperatures and the enzymes and substrate molecules move very slowly and so there are few collisions, too high temperatures and the enzymes change shape (denature) so the substrate molecules cannot fit into the active site. NB – water availability is never a factor that can alter rates of photosynthesis even though it is a reactant molecule. This might seem unusual until one remembers that plants that are dehydrating will close the stomata in their leaves to minimise transpiration. Closed stomata mean that carbon dioxide cannot get into the air spaces in the leaf so this is ultimately what limits photosynthesis in a dehydrated plant. The experimental set up above is the best way to measure rates of photosynthesis and so investigate the effect of any of the four factors listed above. Light intensity can be varied either with a dimmer switch as above or by altering the distance between the lamp and the plant. 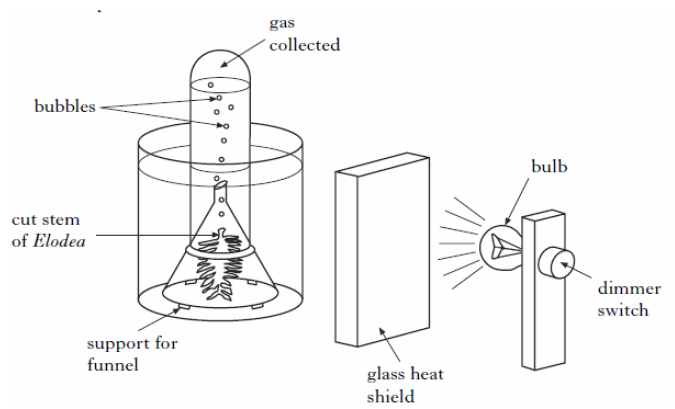 The heat shield is transparent to let light through but will absorb the heat from the bulb ensuring the temperature of the water stays constant. Carbon dioxide concentration can be altered by dissolving different masses of sodium hydrogen carbonate in the water. The wavelength of light will stay constant so long as the build remains the same. How to measure rates of photosynthesis in this set up? Well you could collect the gas produced over a long period of time and measure its volume with a gas syringe. This might sound more accurate than counting bubbles but in fact it is a less reliable way as you would have to leave the set up for a long time and variables might change. So it is fine to assume that the bubbles produced are oxygen and that every bubble is the same volume: if you do this, the rate of production of bubbles is directly proportional to the rate of photosynthesis in the Elodea plant. The leaf is the organ in a plant specially adapted for photosynthesis. You need to understand the structure of the tissues in a leaf together with their functions. Upper Epidermis: this is the tissue on the upper surface of the leaf. It produces a waxy layer, called the cuticle, which is not made of cells but is a waterproof barrier to prevent excessive evaporation through the hot upper surface of the leaf. The upper epidermis cells have no chloroplasts so light passes through them easily. Palisade Mesophyll: this tissue is where 80% of the photosynthesis takes place in the leaf. The palisade cells have many chloroplasts in their cytoplasm and the box-like shape and arrangement of these cells ensures they are packed tightly together. Spongy Mesophyll: this tissue contains large air spaces which are linked to the atmosphere outside the leaf through microscopic pores called stomata on the lower surface. Spongy mesophyll cells also contain chloroplasts and photosynthesis occurs here too. The air spaces reduce the distance carbon dioxide has to diffuse to get into the mesophyll cells and the fact that these cells have fairly thin cell walls which are coated with a film of water together means that gas exchange between air space and mesophyll is speeded up. Lower Epidermis is the most dull tissue in the leaf. The only interesting thing about it is that it contains specialised cells called guard cells which enclose a pore called a stoma. Carbon dioxide can diffuse into the leaf through the stomata when they are open (usually at day time) and water evaporates out of the stomata in a process called transpiration. There are two syllabus points in bold (only tested in paper 2) that refer to embryonic and foetal development. The first asks you to understand the role of the placenta in supplying the developing foetus with nutrients and oxygen and the second concerns the role of amniotic fluid in protecting the developing embryo. The placenta is in many ways a remarkable organ. It contains a mixture of maternal cells from the uterine lining and embryonic cells, but these cells from two genetically different individuals are capable of sticking together to form the placenta. The placenta is only present in the uterus once an embryo has successfully implanted a week or so after fertilisation has happened in the Fallopian Tubes. The placenta is linked to the foetus via the umbilical cord, a structure that contains an umbilical artery and vein carrying foetal blood to and from the placenta. There is a key idea here that is very important. There is no mixing of maternal and foetal blood in the placenta. This would be disastrous for both mother and baby for a whole variety of reasons. 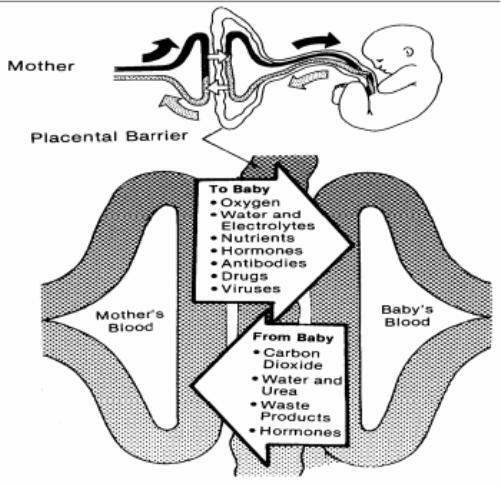 The maternal blood is at a much higher pressure than the foetal blood and if the foetus were connected to the maternal circulatory system directly, its blood vessels would burst. The foetus and mother can have different blood groups of course and you may now that some blood groups are incompatible and can trigger clotting. So it is essential that there is never any mixing of blood. 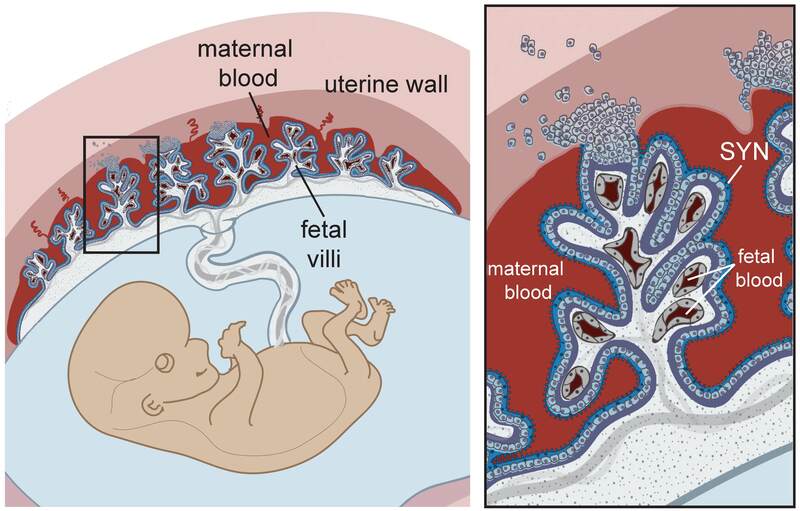 But what happens in the placenta is that mother’s blood empties into spaces in the placenta and babies’ blood is carried by the umbilical artery into capillaries that are found in finger-like projections called villi. This means there is a large surface area and a thin barrier between the two bloods and so exchange of materials by diffusion is possible. The main function of the placenta then is to allow the exchange of materials between the foetal and maternal circulations. The developing foetus inside its mother’s uterus has no direct access to oxygen nor food molecules of course yet both are needed to allow healthy development. The foetus also needs a mechanism to get rid of the waste molecule, carbon dioxide that is being produced in all its cells all the time. Until the kidneys mature fully the foetus also has to get rid of urea, another excretory molecule that could build up to toxic concentrations unless removed from the growing foetus. You will see that antibodies are small enough to cross the placenta. This gives the baby a passive immunity that can protect it for a short time from any pathogens it encounters. Drugs such as alcohol and nicotine can cross the placenta. This is why it is so vital that pregnant mothers do not smoke and drink to ensure that the foetus’ development is not affected by these drugs. The topic of gas exchange in plants is often tested in exams because it can be a good discriminator between A grade and A* grade candidates. If you can master the understanding needed for these questions, important marks can be gained towards your top grade. Firstly you must completely remove from your answers any indication that you think that plants photosynthesise in the day and respire at night. Even typing this makes me feel nauseous…. Yuk? Respiration as you all know happens in all living cells all the time and so while the first half of the statement is true (photosynthesis only happens in daytime), respiration happens at a steady rate throughout the 24 hour period. Although the equations above make it look like these two processes are mirror images of each other, this is far from the truth. How can gas exchange in plants be measured? a) If the tube with the plant is kept in the dark (perhaps by wrapping silver foil round the boiling tube), what colour do you think the indicator will turn? Explain why you think this. b) If the tube with the plant is kept in bright light, what colour do you think the indicator will turn and why? c) If a control tube is set up with no plant in at all but left for two days and no colour change is observed, what does this show? In order to score all the marks on these kind of questions, there are two pieces of information/knowledge you need to demonstrate. You need to show the examiner that you understand that carbon dioxide is an acidic gas (it reacts with water to form carbonic acid) and so the more carbon dioxide there is in a tube, the more acidic will be the pH. As oxygen concentrations change in a solution, there will be no change to the indicator as oxygen does not alter the pH of a solution. Secondly you need to show that you understand it is the balance between the rates of photosynthesis and respiration that alters the carbon dioxide concentration. If rate of respiration is greater than the rate of photosynthesis, there will be a net release of carbon dioxide so the pH will fall (become more acidic). If the rate of photosynthesis in the tube is greater than the rate of respiration, there will be a net uptake of carbon dioxide (more will be used in photosynthesis than is produced in respiration) and so the solution will become more alkaline. a) The indicator will turn yellow in these conditions. This is because there is no light so the plant cannot photosynthesise but it continues to respire. Respiration releases carbon dioxide as a waste product so because the rate of respiration is greater than the rate of photosynthesis, there will be a net release of carbon dioxide from the plant. Carbon dioxide is an acidic gas so the pH in the solution will fall, hence the yellow colour of the solution. b) The indicator will turn purple in these conditions. This is because the bright light means the plant photosynthesises at a fast rate. Photosynthesis uses up carbon dioxide from the water. The plant continues to respire as well and respiration releases carbon dioxide as a waste product. As the rate of photosynthesis is greater than the rate of respiration in these conditions there will be a net uptake of carbon dioxide. 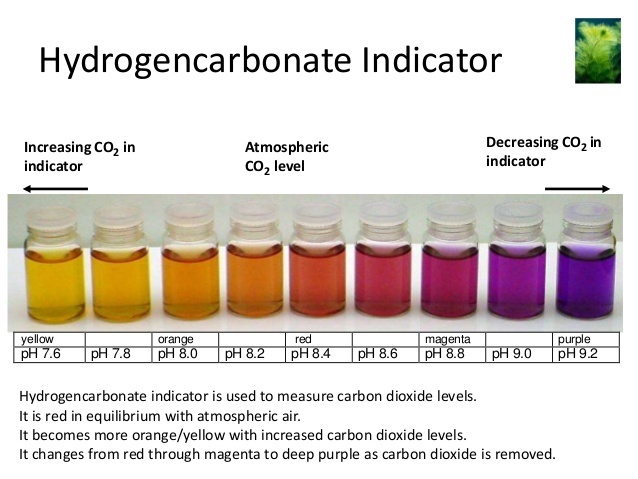 Carbon dioxide is an acidic gas so if more is taken from the solution than released into it, the pH in the solution will rise as it becomes more alkaline, hence the purple colour of the solution. c) This shows that without a living plant in the tube there is nothing else that can alter the pH of the solution. It provides evidence that my explanations above about the cause of the colour change is correct. I am currently working as the Head of Biology at a wonderful co-ed secondary school in Cambridgeshire. I hope this blog will be useful to anyone studying GCSE Biology although it has been written specifically for the EdExcel IGCSE Single Subject Biology course. My main interests away from education are racing, rackets, real tennis and supporting the mighty Cobblers.